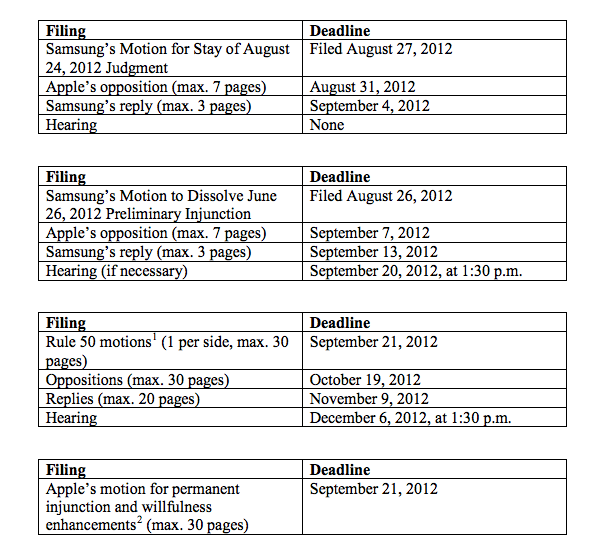 Though the verdict is in, the paperwork continues in the patent dispute between Apple and Samsung. 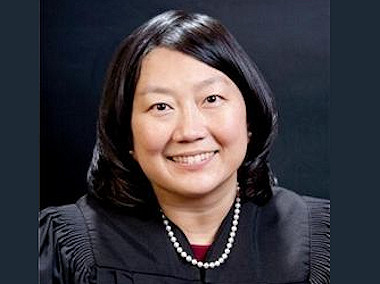 Aiming to put some limits on things, Judge Lucy Koh on Tuesday established a schedule for posttrial filings, as well as a pair of hearings in the case. The parties will indeed show up in court on Sept. 20, though that day’s hearing will cover only Samsung’s effort to have an injunction lifted against the Galaxy Tab 10.1, now that the tablet has been found not to infringe on an Apple design patent. Apple’s request for an injunction against at least eight Samsung phones — as well as Samsung’s effort to have the jury’s verdict set aside — will be heard at a Dec. 6 hearing, Koh announced in a written order released late Tuesday. “Having considered the scope of Apple’s preliminary injunction request, the additional posttrial motions that the parties have already filed and will file, and the substantial overlap between the analysis required for Apple’s preliminary injunction motion and the parties’ various other posttrial motions, the Court believes consolidation of the briefing and hearing on the post-trial motions is appropriate,” Koh said. The December hearing date means that the injunction will likely have even less practical impact. The phones in the case are mostly older models, though the list does include several versions of the Galaxy S II, which is still being sold, as well as Verizon’s Droid Charge. A seven-man, two-woman jury last week unanimously found Samsung liable for infringing a number of Apple’s design and feature patents, and ordered Samsung to pay more than $1 billion in damages. The jury also found that, in many instances, Samsung’s violations were willful, a finding that could lead Koh to as much as triple the damages. Assuming that Koh doesn’t overturn the jury verdict, Samsung’s next move would be to appeal the decision to the Washington, D.C.-based Federal Circuit, which has authority over patent cases.